Brittany Blake, a nurse anesthetist at Mayo Clinic’s Florida campus, has participated in many international missions trips over the past five years. But her recent experience as a volunteer with Mercy Ships, an international faith-based organization that sends floating hospitals to some of the poorest nations is the world, was different than any of her other missions. This time, she could put her medical training to work. 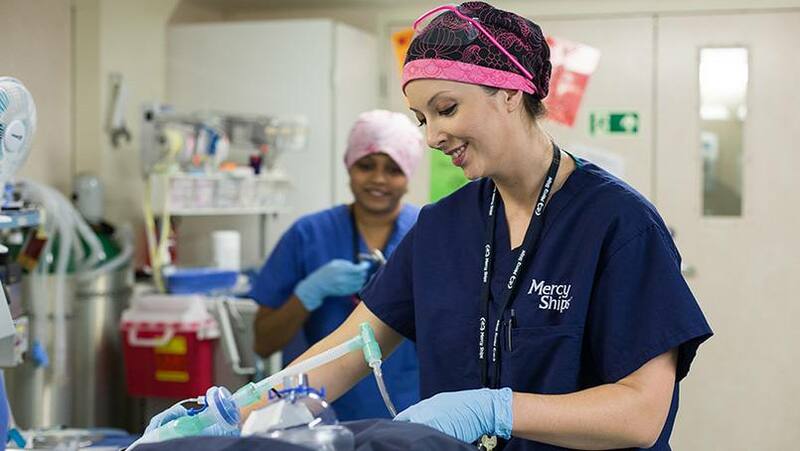 “I wanted to use my advanced skills to perform anesthesia for the life-changing surgeries Mercy Ships volunteers perform,” says Brittany, who has worked at Mayo Clinic for seven years. Brittany spent two weeks in October and November 2016 in the West African port of Cotonou, Benin, as part of an all-volunteer medical staff and crew of 1,000 aboard the ship "Africa Mercy." The ocean liner is the world’s largest nongovernmental hospital ship, dedicated to the African continent. Blake prepared patients who lacked safe, affordable surgical and anesthesia services for operations such as cleft lip and cleft palate repair, cataract removal, facial reconstruction, orthopedic procedures, and obstetric fistula repair. One notable example she recalls was helping with the surgery of an 18-year-old pregnant woman who had a grapefruit-sized dental tissue tumor that blocked her mouth and prevented her from eating. The woman couldn’t swallow and was severely malnourished. Brittany says she has returned with a great appreciation for the resources and the Model of Care that enable Mayo Clinic staff to improve the health and well-being of patients and communities around the world. Like Mayo Clinic, Mercy Ships offers training for medical professionals, including surgeons, nurses and advanced-practice providers, to help strengthen the local health care systems of the countries where the organization docks. Blake says she hopes her experience will inspire other health care professionals to use their medical expertise to bring quality health care to people in developing nations. Read more about Mercy Ships.